This spring, my roommate and I decided to take on a new challenge. This challenge was…we were going to see if we could…possibly…grow our own herbs. We actually picked up a little kit from a local store that gave us five different herbs to grow. Sadly, the cilantro and the parsley didn’t quite survive the first wave of heat and humidity, despite our best efforts. This left us with chives, basil and oregano. So far…they’ve been doing well. The break in the hot summer weather has worked in favor for those three herbs, at least. So I promised her that I would make her some biscuits that included chives in some way, shape or form. I also know that she loves cheese and she loves garlic. 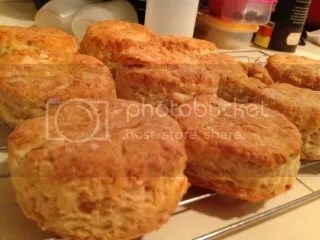 I found a base recipe for some flaky biscuits on a blog called Whole and Heavenly Oven…and then made my own adjustments to make it work within my own diet restrictions. I will note that I didn’t roast my own garlic. I had a jar of roasted garlic in my fridge, so I used about 2 tablespoons of the garlic instead of roasting a head of garlic myself. But, roasting garlic is easy and I’ll include those instructions from the original recipe in case you don’t have the jar of roasted minced garlic like I did. 2 cups buttermilk (I used unsweetened almond milk)*NOTE: If you are using the jarred minced roasted garlic, you don’t need these ingredients. If you are roasting your own garlic, preheat the oven to 400°F. Place garlic in a small baking dish and drizzle with olive oil. Cover with foil and bake for 35-40 minutes, or until garlic is soft. Cool slightly then finely chop. Set aside. Using a pastry cutter, or your fingers, work in cold butter, shredded cheese, chives, and chopped roasted garlic until crumbly. Pour buttermilk over all and gently stir until a shaggy clump of dough forms. Turn dough onto a floured surface and gently knead until dough is smooth. Pat dough into a 3/4 in circle. Using a biscuit cutter, cut out biscuit shapes and place on parchment paper-lined baking sheets. Keep doing this until all the dough is used up. Bake biscuits at 400°F for 15-18 minutes, or until lightly golden. Cool on wire cooling racks. Store biscuits in an airtight container at room temperature up to 3 days. Much to my delight (and I admit…surprise), what emerged were these golden, flaky, amazing biscuits. My roommate had one hot from the oven and she raved about the flavors. These will be part of our breakfast lineup this week for certain. I already scrambled up eggs and placed between a sliced biscuit with some greens for breakfast this morning. HUGE win on the breakfast front. I will definitely be making these again! This entry was posted in Baked Goods, Bread, Breakfast, Cheese, Clean Eating, Dough, Food, Gluten-Free, Recipe, Sandwich, Side Dish, Snacks, Vegan, Vegetarian by The Celiathlete. Bookmark the permalink. Thank you! They came out perfectly. Light AND flaky! Not an easy thing to achieve!